This is an artist you don’t want to miss! “Stop in between classes, grab something to eat downstairs, and join us in the Noontime lounge right above Panda Sushi! In an era of fluff, filler and intellectual starvation, Stephanie Carlin’s full-band debut Tree of Series is a music respite. There is strength, power, humor and humility that belie her years on this planet. Carlin speaks with wisdom and offers emotional substance in an age of planned obsolescence and temporary notions of illusory complacency. Finding a sweet spot that forbids easy pigeonholing, Carlin teeters on the line where jazz phrasing and spontaneity fuse with the melodic syncopation of funk and a lush, organic folk twinge. Her intimate melodies on voice and acoustic guitar explode with power alongside a remarkably blossomed band: Xander Naylor (electric guitar), Javi Santiago (piano), Russ Flynn (bass) and Wes Reid (drums). Together, they recorded Tree of Series live on January 3-6, 2012 at Hoboken Recorders, a hidden gem on the outskirts of New York City. 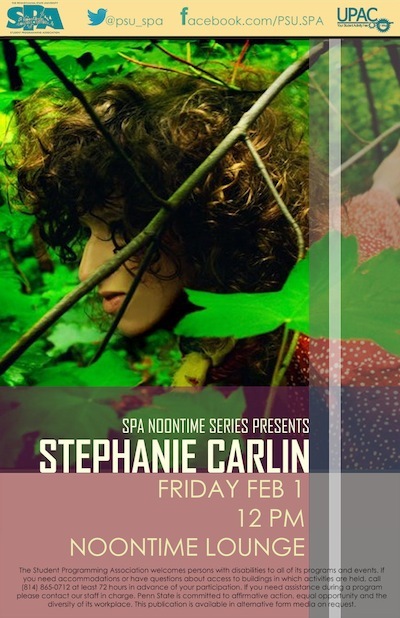 Since Carlin moved to Brooklyn in 2008 she has brought her original music to over 200 notable venues and festivals (CMJ Music Marathon, Knitting Factory, Cornelia Street Café, Mercury Lounge, The Stone, Southpaw). She holds a B.F.A. in jazz performance and audio production from Long Island University’s Brooklyn campus. Check out her cover of “Lose Yourself” by Eminem!